Smith & Nephew I.V. 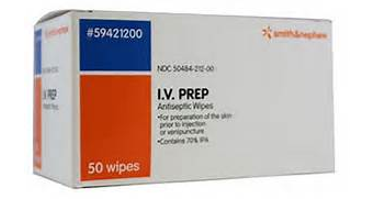 Prep Antiseptic Wipes are used for preparation of the skin prior to a venipuncture or injection. Provides a clear, one-step antiseptic for IV site preparation, as well as a film which may help reduce skin trauma associated with adhesive removal when dressings are changed.